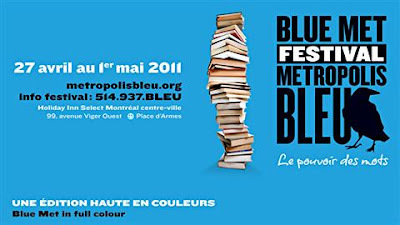 Today is the opening of the 13e Festival littéraire international de Montréal Metropolis bleu (13th Blue Metropolis Montreal International Literary Festival). It brings together writers and artists from around the world and includes readings, workshops and talks. The program features over 170 activities and more than 200 writers and artists. As part of the festival, they are holding their 4e Festival des enfants Metropolis bleu (4th Blue Metropolis Children's Festival) at the same time. The program for the children's section can be viewed online here. This year the festival takes place at the Holiday Inn Select Montreal Downtown Hotel, located at 99 Viger Avenue West, H2Z 1E9 (corner of St. Urbain) 514 878-9888. It runs until May 1. Blue Metropolis is proud to announce its 13 th Montreal International Literary Festival, taking place from April 27 to May 1st, 2011 at the Holiday Inn Select Downtown Montreal. This year’s event features over 170 activities and more than 200 writers and artists, representing 12 countries and seven languages. The annual event promises to be an astonishing literary trip to the metropolises of other cultures. 2011 Blue Metropolis International Literary Grand Prix. As always, Blue Metropolis will award its annual International Literary Grand Prix to an author at the festival. But new this year: the winner will only be announced at the opening night celebration, held on Wednesday, April 27. Who do you think it will be? The general public is invited to attend the opening event, where the winner will receive his or her award. The $10,000 award recognizes a lifetime of literary achievement by a writer of international reputation. A Celebration of Indian Writing . Organized in close cooperation with the Year of India in Canada, and thanks in part to the support of The Cole Foundation, this series of events invites visitors to discover the provocative and sometimes shocking poetry of the young Kamala Das, the dense and playful prose of Amitav Ghosh, and exciting readings by some of India’s most famous and celebrated writers. Scotiabank Giller Prize Event . For the first time at the Festival, we present the Scotiabank Giller Prize Event, a conversation between the 2009 Scotiabank Giller Prize winner, Linden McIntyre , and the 2010 winner, Johanna Skibsrud . This prestigious event will be held at the oldest chapel in Montreal, Notre-Dame-de-Bon-Secours, in the Old Port, on Saturday, April 30. The Al Majidi Ibn Dhaher Arab Prize . The recipient of this year’s Blue Metropolis Arab Prize could not be more current: Alaa Al Aswany, who recently gained attention for his 2011 book, On the State of Egypt , which – in addition to his novels – criticizes the Egyptian regime. This award is sponsored by the Abu Dhabi Authority for Culture and Heritage and will be presented on Thursday, April 28 at 6 p.m.
Strega Prize . The relationship between Blue Met and the local Italian community is as strong as ever. In conjunction with the Italian Cultural Institute and the Bellonci Foundation, the Blue Metropolis Strega Prize will be awarded to novelist Antonio Pennacchi for his novel Canale Mussolini at a ceremony on Saturday, April 30. Blue Met is pleased to announce that this event – and each year’s Strega Prize winner – will be a regular part of our future programming. CBC Blue Series/ La Série littéraire Radio-Canada . Year after year, this series of events is one of the festival’s most popular. Hosts Eleanor Wachtel, Michael Enright, Sue Smith, Jeanette Kelly, Christiane Charette, Anna Asimakopulos and special guest host, Noah Richler, interview literary stars such as Gore Vidal , Alexandre Jardin , Amitav Ghosh , and Bernhard Schlink . As It Happens host Carol Off moderates the Blue Metropolis Scotiabank Giller Prize event. Writers in Peril . Our 4th annual series, in conjunction with Media@McGill and Reporters without Borders, aims to explore the issues that writers face when confronted with the dangers of oppression, threats, censorship and revolution. With Alaa Al Aswany , Gilbert Sinoué , Caroline Fourest , and Taslima Nasreen . Master Classes and Student Literary Workshops . With limited pre-registration spots, these writing workshops are often sold out before the Festival even begins. It’s no wonder with authors of the calibre of Anne Fine , Kim Thuy , Eric Fottorino , and Johanna Skibsrud . 4 th Annual Blue Metropolis Children’s Festival, presented by TD . Over 75 free literary activities are offered for children under the age of 12 and their families. More than 50 authors, illustrators, storytellers, actors and musicians will share their literary universe in 50 plus venues across the island of Montreal, including libraries, museums, bookstores, community and cultural centres (See extended press release). Blue Metropolis Foundation is a not-for-profit organization founded in 1997 that brings together people from different cultures to share the pleasures of reading and writing. The Foundation produces multilingual literary activities, such as the Blue Met International Literary Festival, the Blue Met Children’s Festival, the International Literary Series, and education programmes for young people. To learn more about who we are, visit www.bluemetropolis.org . Since the very first Festival, more than 2,000 writers, journalists, publishers, artists and no less than 120,000 visitors have gathered in Montreal to experience Blue Met.